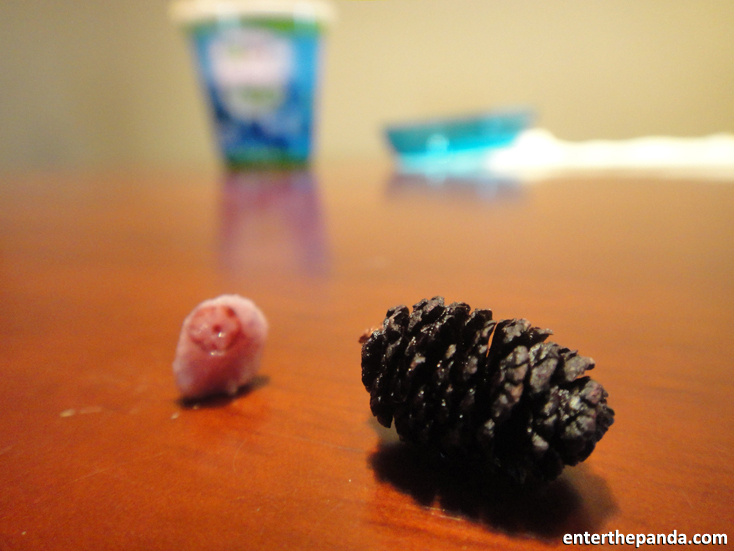 That's not a blueberry... - Enter the Panda Ltd. | Enter the Panda Ltd. 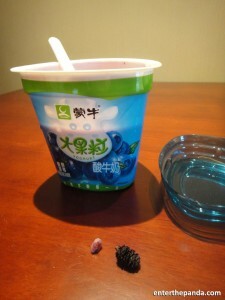 Almost every morning on my way into work, I stop at my local Jingkelong (Chinese Supermarket Chain) to buy a Yoghurt. It’s usually a Blueberry one with real blueberries in because I am a great believer in the health benefits of Blueberries. I also am careful about which brand of Yogurt I buy since the melamine scandal and various food safety and quality scares. Now I know this is scandal was mainly related to powdered milk but after reading, one cannot be too careful with any processed food they buy. So to make myself feel safer and more at ease with my purchase, I buy Mengniu brand which has taken the moral high ground during the melamine crisis and done very well out of it. However, this morning after taking several scoops of this tasty yoghurt I felt something slightly harder than the normal soft, skinned blueberries (shame, because the skin is the healthiest part!). To my relief it wasn’t any insect or part of an animal but a small pine cone from a tree commonly found in China. Now of course you or I don’t expect to find this in our food but what does it mean for their quality or the size of particles they allow to go in their yoghurt? I am happy that it was something natural and not artificial or (part of) something else! Nevertheless, I can’t help thinking what else might have made its way into this mix. I do believe that China is actively trying to catch up with the rest of the world in terms of food safety standards, unfortunately I am fussy enough with my eating habits to have been completely put off. Sorry Mengniu, it was nice while it lasted however it’s been ruined and I won’t be buying your brand again. The psychological effect of finding another crunchy bit in your yoghurt has put me off. It could have been worse, much worse. How would this experience affect you? Would you continue to purchase a product after finding an ‘alien’ ingredient? Have you had similar experiences? We’d like to hear your comments. UPDATE: A local friend has passed on this news link to us (sorry, Chinese only) which seems to be the Mengniu boss guaranteeing the quality of Mengniu products for export to Hong Kong and the world, but not making the same promise for their products sold in Mainland China.